It’s election season which means more opportunities to point, laugh, and cry at the state of voting usability. The first is sent in by Kim W. As part of an NPR story, the reporter dug up a sample ballot. Pretty overwhelming and confusing (“vote for not more than one”?? ); makes me long for electronic voting. Next, Ford is sending out a software update to their popular MyTouch car telematics system. The following NYT article is excellent in highlighting the importance of not only basic usability but that “user experience” is just as important as technical capability/specs. The article lists a variety of usability quirks that should have been caught in user testing (e.g., “a touch-sensitive area under the touch screen that activates the hazard lights has been replaced with a mechanical button, because Ford learned that drivers were inadvertently turning on the hazard lights as they rested their hand while waiting for the system to respond.”). I am being facetious when I point an laugh but seriously, many of these issues could have been caught early with basic, relatively cheap, simple user testing. “I think they were too willing to rush something out because of the flashiness of it rather than the functionality,” said Michael Hiner, a former stock-car racing crew chief in Akron, Ohio, who bought a Ford Edge Limited last year largely because he and his wife were intrigued by MyFord Touch. Now Ford has issued a major upgrade that redesigns much of what customers see on the screen and tries to resolve complaints about the system crashing or rebooting while the vehicle is being driven. Ford said on Monday that the upgrade made the touch screens respond to commands more quickly, improved voice recognition capabilities and simplified a design that some say had the potential to create more distractions for drivers who tried to use it on the road. Fonts and buttons on the screen have been enlarged, and the layouts of more than 1,000 screens have been revamped. With the U.S. election only a week away, I bring you a tale of warning from Finland. Today, the Ministry of Justice revealed that due to a usability issue, voting was prematurely aborted for 232 voters. The pilot system was in use in three municipalities; this amounts to about 2 per cent of the electoral roll. Seats in the municipal assemblies are often determined by margins of only a couple of votes. 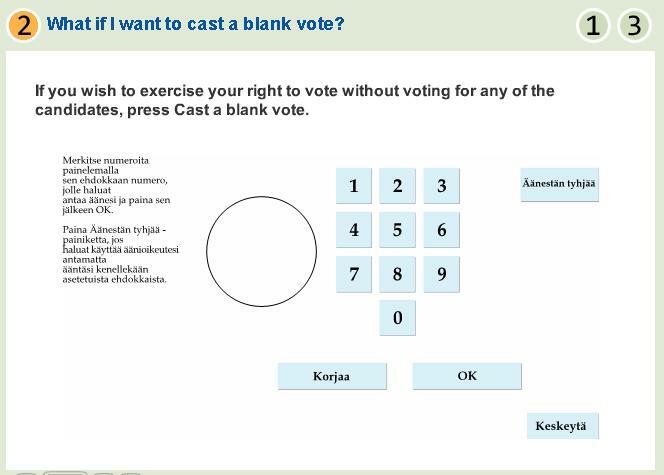 It seems that the system required the voter to insert a smart card to identify the voter, type in their selected candidate number, then press “ok”, check the candidate details on the screen, and then press “ok” again. Some voters did not press “ok” for the second time, but instead removed their smart card from the voting terminal prematurely, causing their ballots not to be cast. A designer might negate the problems of 2% of users for some systems, but voting machines should be held to to a higher standard. You might not catch 2% with Nielsen’s standard 4-6 users testing the system (or “none” as I suspect was true of the Finnish system.) If you want to judge for yourself, a flash demo of the system is available here. They apparently enter a number code for a candidate. [Added 29th Oct:] There has now been at least one report of touchscreen issues. A voter had repeatedly tried to click on “ok”, but either due to system lag or touchscreen sensitivity problems, it took “minutes” to get the button press registered. If hit by this type of problem, the voters may well have thought that the ballot casting process had completed. Finding sources for this post was difficult, as most of the sites were in non-translatable Finnish, a language not supported by Google or Babelfish. I would especially like to know the age of the touchs screen user and if s/he had any defining characteristics that might relate to the difficulty with the screen. 2% may not sound like much, unless you’re in the 2%. I suppose the most comforting knowledge is that usability issues probably won’t affect one party more than the other. I‘m impressed by Slate’s detailed look at ballot design. Check out the alternative designs! The answer: not far. A study carried out by USA Today and seven other newspapers in 2001 concluded that faulty design, not punch-card machines, was responsible for voters’ confusion in Palm Beach County in 2000. Despite this finding, states have focused their election-reform energies on upgrading old punch-card machines to optical-scan systems or on implementing electronic voting. They have dismissed or ignored the butterfly layout’s problematic design as an aberration—a stupid mistake on the part of local officials…. …Developed with a team of graphic and industrial designers, Lausen’s elections redesign proposal convinced the state of Illinois to change its election code to allow candidates’ names to be printed in lowercase, among other things. Oregon is implementing the group’s recommendations, and Lausen was just contacted for consultation by Texas. And this January the AIGA is publishing Election Design: Models for Improvement, a book of templates based on the principles of good typographic design…. How many times do we have to say that paper is not the problem? *On the original, be sure to note the Cali tagline of “I voted, have you?” Um, when is someone going to tell them that the person reading this is actually IN the voting booth? What’s the right answer… “Yes” “No, forget this! I’m leaving!” “Well, I was halfway done when you asked me”? Succinctly, declined-to-state voters have to ask for a Democratic ballot. Then they must fill in a bubble at the top of the ballot, saying that they wanted to vote in the Democratic primary. Obviously, many users might not do this, as it seems a redudant code… the ballot they are holding is the Democratic ballot, so why indicate again that it was the ballot they requested? 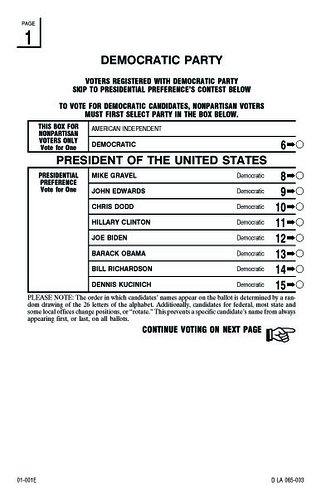 If you look at the ballot below, it says at the top to “select party in the box below.” Of course, there is only one option, which makes it not much of a selection. It’s likely this area of the ballot was inserted to produce some interesting statistical information (rather than a pure answer of who received the most votes.) If only declined-to-state voters filled the bubble, you could get a count of how many of those voters came out to vote compared to other years, how many chose to vote Democrat, and which candidate received most of their support. While interesting (I would like to know all of those things) it complicates the purpose of primary voting: to count the number of Americans who support a particular candidate. Why I am not a conspiracy theorist: People with the best of intentions make critical human factors design errors, even errors that cost people their lives (see “Set Phasers on Stun.”) Sometimes, these errors are created by specific good intentions, as in the Florida hanging-chad fiasco. The reason the choices were staggard on each side of the ballot was to increase the font size, supposedly making the ballot more clear for older voters. This perceptual aid was trumped by the resulting cognitive confusions. 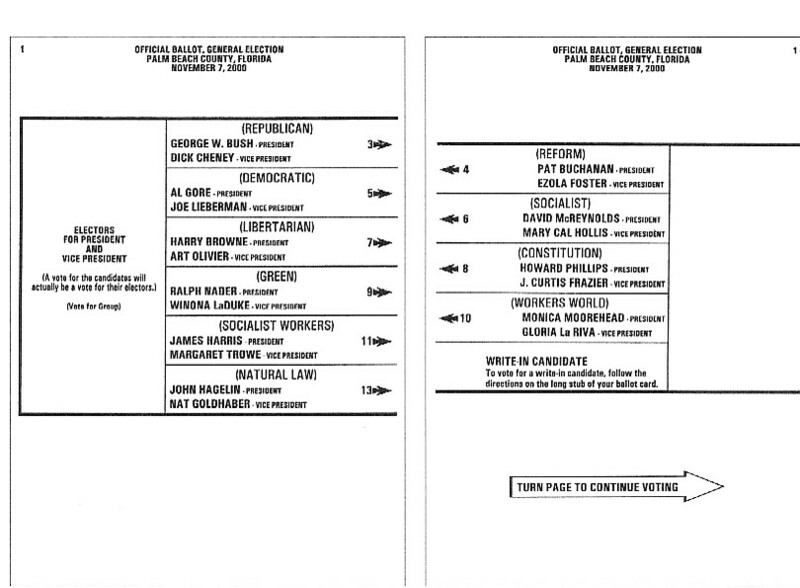 These ballot designs may suffer from a lack of user testing, but not from an intentional ploy to keep declined-to-state voters from being counted or to get Pat Buchanan more votes. Thus, let’s tackle the problem rather than using ‘double bubble’ for a slow news day. Why don’t we demand all ballots and voting machines be user tested? (Security is another issue, for another blog.) If you have an idea of what action to take, please comment so a future post may provide detailed instructions.